How can a mother and daughter who love (but don’t always like) each other coexist without driving each other crazy? It’s the universal question that has defined mothers and daughters from Demeter and Persephone to Debbie Reynolds and Carrie Fisher. 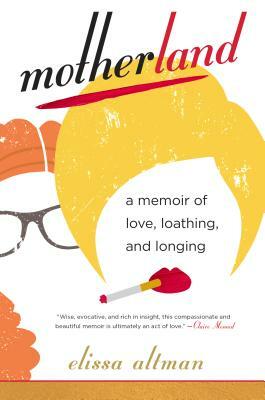 After surviving a traumatic childhood in nineteen-seventies New York and young adulthood living in the shadow of her flamboyant mother, Rita, a makeup-addicted former television singer, Elissa Altman has managed to build a very different life, settling in Connecticut with her wife of nearly twenty years. After much time, therapy, and wine, Elissa is at last in a healthy place, still orbiting around her mother but keeping far enough away to preserve the stable, independent world she has built as a writer and editor. Then Elissa is confronted with the unthinkable: Rita, whose days are spent as a flâneur, traversing Manhattan from the Clinique counters at Bergdorf to Bloomingdale’s and back again, suffers an incapacitating fall, leaving her completely dependent upon her daughter. Now Elissa is forced to finally confront their profound differences, Rita’s yearning for beauty and glamour, her view of the world through her days in the spotlight, and the money that has mysteriously disappeared in the name of preserving youth. To sustain their fragile mother-daughter bond, Elissa must navigate the turbulent waters of their shared lives, the practical challenges of caregiving for someone who refuses to accept it, the tentacles of narcissism, and the mutual, frenetic obsession that has defined their relationship. Motherland is a story that touches every home and every life, mapping the ferocity of maternal love, moral obligation, the choices women make about motherhood, and the possibility of healing. Filled with tenderness, wry irreverence, and unforgettable characters, it is an exploration of what it means to escape from the shackles of the past only to have to face them all over again. Elissa Altman is the critically acclaimed author of Poor Man’s Feast: A Love Story of Comfort, Desire, and the Art of Simple Cooking and the James Beard Award–winning blog of the same name and Treyf: My Life as an Unorthodox Outlaw. Her work has appeared in O: The Oprah Magazine, The Wall Street Journal, The Guardian, The New York Times, Tin House, The Rumpus, Dame Magazine, LitHub, Saveur, and The Washington Post, where her column, “Feeding My Mother,” ran for a year. Her work has been anthologized in Best Food Writing six times. A finalist for the Frank McCourt Memoir Prize, Altman has taught the craft of memoir at the Fine Arts Work Center in Provincetown, The Loft Literary Center, 1440 Multiversity, and Ireland’s Literature and Larder program, and has appeared live on stage at TEDx and The Public, on Heritage Radio, and widely on NPR. She lives in Connecticut with her family.